Looking For The Best Selection Of Sweets Around? You've come to the right place... the home of sweets on the internet! 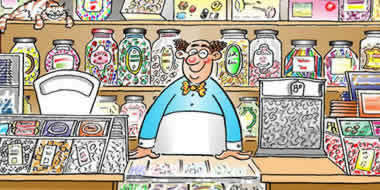 A Quarter Of... is the original, fun online sweetshop - with over 650 of the best sweets around, at great prices. Many of them will be sweets that you remember from your childhood... and which you probably thought had long since disappeared. But no! We stock the sweets that will bring your childhood memories flooding back! What Are Our Most Popular Sweets?.